Like an outdoor climbing gym, Horseshoe Canyon of northern Arkansas is riddled with chickenheads, incuts, crimps, jugs, and plates. It’s notoriety continues to gain traction and the canyon is quickly becoming internationally known for having the best moderate-grade sport climbing in the world. Not only that, everyone is taking notice of the world-class bouldering, from classic moderates to futuristic projects film crews can’t turn away from. And what’s more, all 900+ routes and boulder problems are housed within a compact canyon with a fully-functioning dude ranch, including amenities like cabins, hot tubs, a lodge, gear shop, a half-mile long zipline, camping, etc., all with less than a 10-minute walk to the rock. The annual 24-Hours of Horseshoe Hell Climbing Competition is also held here every year. 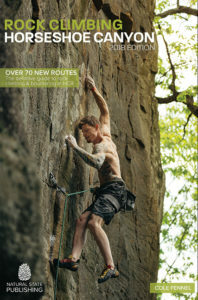 Be sure to check out what’s new as this exhaustive guide has more routes and problems than any other and is the official book of the 24HHH.